Allie Quigley negotiates over defensive pressure from Alexis Peterson. Quigley finished with a team-high 25 points for the Sky. Photo by Neil Enns/Storm Photos. 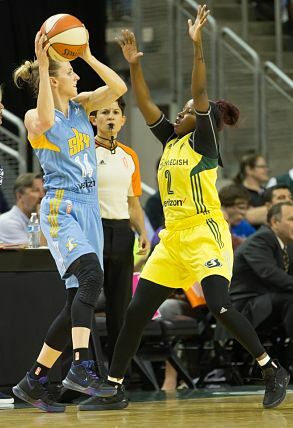 Seattle – For the first 10 minutes on Tuesday night, the Seattle Storm were nearly perfect. After making 12 of its first 13 shots, the team led 29-11 after one quarter in its most efficient start of the season. By halftime, that lead was down to one, and Chicago would take the lead early in the third and never looked back, as the Sky spoiled Seattle’s first-half finale in front of a national television audience, 94-83 at KeyArena. Allie Quigley led all scorers with 25 points, while Keisha Hampton had a season-high 14 off the bench for Chicago. Breanna Stewart had her seventh-straight 20-plus-point performance for the Storm, finishing with 25 and 11 rebounds, followed by 16 apiece from Jewell Loyd and Crystal Langhorne, and 10 from Sue Bird. Seattle (9-11) started the night on a 7-0 run, and led 15-7 by the first break with all five starters having scored. After one quarter, that advantage was 18. That cushion, however, was short-lived. Chicago (7-13) outscored Seattle 30-13 in the second — including a 23-7 run — cutting the deficit down to one with nine points from Hampton off the bench and seven from Tamera Young leading the way. A jumper from Young in the opening moments of the third gave Chicago its first lead of the night, one the Sky stretched to as many as five in the period. The teams traded that lead for much of the quarter, but a Quigley jumper with 1:37 to go put the Sky up for good. After a Cheyenne Parker jumper early in the fourth, Seattle didn’t get the game back within one possession. The Sky shot nearly 60 percent from the field in the final quarter, the team’s second-highest scoring fourth quarter this season. The Storm also had no answer for the Chicago bench, which outscored Seattle’s 42-8 for the night. After the game, Stocks had praise for center Imani Boyette, who “provided a great spark for us,” Kahleah Cooper, who “did a fabulous job of attacking the basket and getting to the rim,” “our workhorse,” Parker, and “fabulous scorer” Hampton. “Those four did a great job of impacting the game for us off the bench,” Stocks said. While Bird said the Sky played well on Tuesday, it was Seattle’s own mistakes that proved costly. Stewart too said Seattle didn’t have a response for Chicago’s run. Seattle now enters the All-Star break ahead of this weekend’s festivities in Seattle, with Bird and Stewart both suiting up for the West. Chicago, which has now won four of its last five games, finishes its pre-All-Star slate on Thursday at Los Angeles. Stefanie Dolson and Quigley will return to Seattle for the All-Star Game, with the latter facing Bird in the halftime 3-point competition. The Storm hosted “Stand with Planned Parenthood” night on Tuesday, with $5 of every ticket sold donated to the organization. With a crowd of more than 8,000, that means more than $40,000 goes to PP. Tuesday was the first of three games between the Storm and the Sky this season. The two teams will meet twice more in Chicago, on Aug. 20 and Sept. 3. Crystal Langhorne’s streak of consecutive made field goals ended at 21 after a missed jumper in the second quarter. That was two short of the league record, set by Los Angeles’ Nneka Ogwumike. Cappie Pondexter missed her fifth-straight game for Chicago, and remains in the WNBA concussion protocol. Makayla Epps and Amber Harris also did not play for Chicago, while Lanay Montgomery sat for Seattle.